Last Monday night, as I was driving home from work on a slushy, dark Interstate 89, this text popped through from my friend Helen: "pretty scrumptious locally raised pork chop here with your name on it! 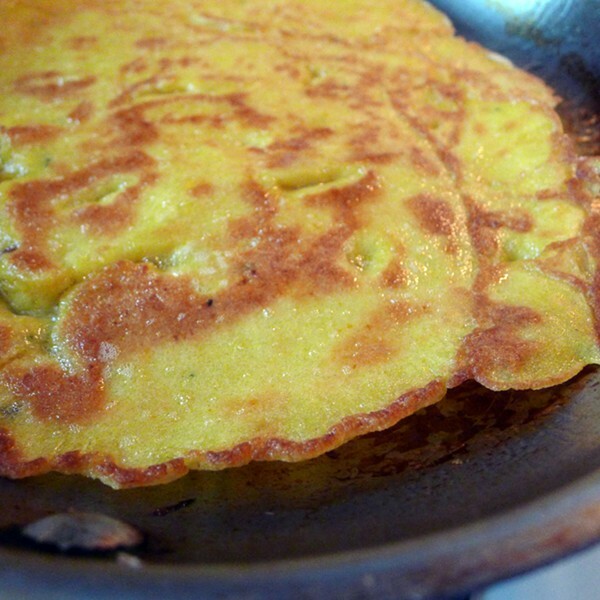 green chili sauce and spaghetti squash too." Usually when I'm tired, I reach for carbs — pretzels or pasta or roasted potatoes — yet this starch-less dish sounded like it had descended from heaven. For the last few months, I had felt sorry for what Helen had been eating, not because she's a terrible cook (she's fabulous) but because she and her husband had "gone paleo." The first time I met them after their conversion, I finished off a plate of cubed cheese and bread while they nibbled on shrimp, and I secretly mourned that she and Dave might never again enjoy the pleasures of crusty bread, cheese or, better yet, cheese melted over bread. The paleolithic diet has been around since the 1970s when gastroenterologist Dr. Walter Voegtlin began promoting the idea that the human body does best on the foods we ate as hunter-gatherers— basically, fish, grass-fed meat, eggs, nuts and fresh vegetables and fruit. On its surface, the paleo diet appears to be a modern take on the low-carb Atkins diet of the ’90s, but with an emphasis on pasture-raised meats and the total exclusion of grains and dairy. By cutting these things from our diet — which we never should have been eating in the first place, according to Dr. Voegtlin — we can slim down and keep all kinds of nasty diseases at bay. Why paleo has gained traction of late, I'm not sure, but I know at least four people who have gone paleo/primal in the past year. Helen has lost 14 pounds since she began, and her husband has lost 10; my colleague, Alice Levitt, has lost 30 pounds since last summer, and says she doesn't miss eating grains at all (when she's not working, that is). I couldn't stop by Helen's place that night, so instead I baked some homemade pizza at home. When I woke up the next morning still feeling stuffed and heavy, something tripped in me — and I began Googling paleo recipes, dropping in on the dozens of blogs devoted to the subject. It seemed like both an intellectual and culinary challenge to try and cut out grains, and replicate starchy standbys with vegetables (cauliflower rice, anyone?). Then, as my first paleo act, I did what any typical carb addict would do: I baked paleo muffins. These consisted of eggs, mashed bananas, almond butter, coconut oil, baking powder and a shower of walnuts. Though I doubted that the muffins would be anything but lead bricks, they were actually kind of tasty, and only a little bit strange. During the three days since, I've downed seared salmon, grilled sausages, short ribs, kale, chard, and glazed, roasted quail. I feel like I'm in the midst of a protracted fat-and-protein-fest, with my heart's health possibly on the line. Not everything's a win: Coconut creamer in my tea was a solid blech, and puréed parsnips were novel at first but became cloying after a second portion. As far as I can tell so far, "going paleo" means ingesting eggs, coconut oil (which is imbued with almost mythic status) and pureed root vegetables in staggering amounts. ("And bacon," reminded Helen earlier today). I've also eaten more coconut oil in three days than I'd eaten during my entire life before. This is what passes for paleo bread: pumpkin flatbread whose batter consists of eggs, tapioca flour, salt, puréed pumpkin and, yep, coconut oil. While again I was wary, they fried up like flatbreads-slash-omelettes, and I devoured the first one even before the second one hit the pan. The paleo gods were wise about human nature; they built in an 85:15 rule that allows three "cheat" meals per week. Helen's most recent cheat: raclette. Mine: feta, milk, mozzarella, two pretzel sticks ... I guess I have a ways to go. My only modification to this excellent recipe: minced fresh rosemary and garlic and lots of black pepper. I've truncated the instructions, but you can find the original recipe (plus photos) on the blog. 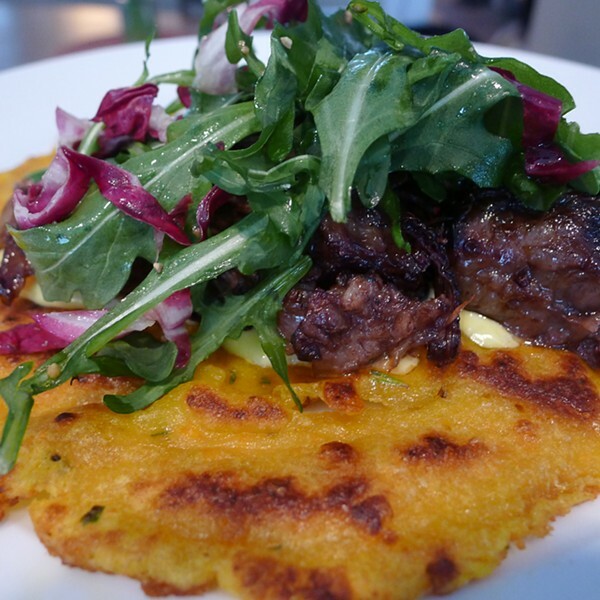 And I used them as a base for an open-faced torta of wine-braised short ribs, aioli and an arugula salad. Combine all ingredients in a deep mixing bowl. The batter should be about the same consistency as pancake batter, and as smooth as you can make it. An electric blender works well, but a fork is fine. In the meantime, heat up a quarter of the oil (1/2 tablespoon) in a pan on medium-low heat until hot. Pour a fifth or so of the batter into the pan and spread it around with a spatula — or pick up the pan and tip it every which way, letting the batter even itself out. You want it to be as thin as the pan will allow. Let it cook until the bottom side is slightly browned (about five minutes), then flip it with a large, flat spatula. Let the other side cook until it’s slightly browned, as well, about three to five minutes. The longer you cook them, the crispier they’ll be on the outside. You can flip them a few times while they cook so that they don’t get too hot and burn.